This tree across the stream is a trickier bridge than it might seem... The author of The Great From Race and Other Poems has created a collection of short poems that celebrate trees and the amazing variety of ways they touch our lives. Deceptively simple verses reveal what trees think about and what they say to one another, as well as how they look and all the things they do for us. Humor and an unerring ear for the sounds of language make these poems an irresistible read-aloud; the luminous oil paintings evoke a country setting and the children who enjoy it through the year. 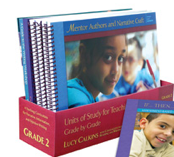 Don't miss the Teacher's Guide page! anchoring itself firmly to earth. 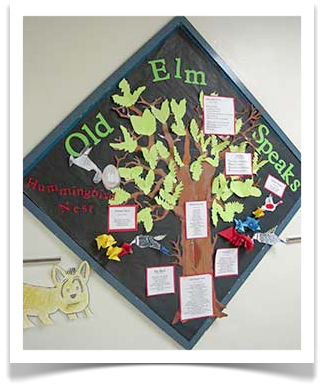 Tree owns this place in the universe..."
Writing OLD ELM SPEAKS took me deep into the landscape of childhood memories. I have always loved the quiet dignity of trees and in writing these thirty poems, I tried to honor tree's "place in the universe." Family vacations to Colorado inspired "Fly Fishing on the Crystal River," and "Woods' Lake." I saw the devastation of "Avalanche" outside Marble, Colorado. Two horses "sharing" a strip of shade on a drive to Durango inspired "Cooperation." I first met the itinerant maple shoot in "Maple Shoot in the Pumpkin Patch" when it "helicoptered" past my kitchen window. Suddenly, I found myself wondering: Where had it been? Where was it going? (I finished the dishes after I wrote a first draft of this poem.) And, the title poem, "Old Elm Speaks" was inspired by the view of the Chinese elm outside my office window as it "snagged" the moon. 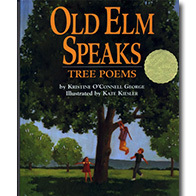 In the meantime - while we're waiting for the giant sequoia to grow - Kate Kiesler and I hope you enjoy OLD ELM SPEAKS: Tree Poems. "The team that brought us The Great Frog Race and Other Poems have turned their extraordinary talents to produce an elegant volume paying homage to trees...Readers of all ages will breathe deeply over this exceptional book of true poetry." 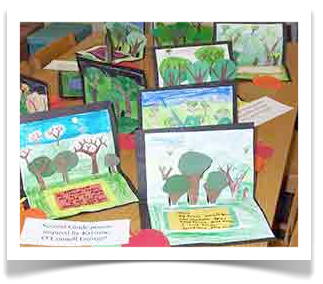 "What a delight to find among the surfeit of humorous verse for children, a fresh new voice that speaks the language of real poetry...Vivid poems and sparkling clear images will inspire children to look at trees in new ways, to feel the very heart of a tree, even to write their own tree thoughts. Full color oil paintings by Kate Kiesler picture the singular beauty of trees."